Just for you: free entry to Edinburgh Castle and the Royal Botanic Gardens. The beauty of Edinburgh is just waiting to be discovered. This city of high culture and lofty ideals, of art and literature, philosophy and science is known to some as the Athens of the North. Home to the world's biggest arts festival and breathtaking architecture, Edinburgh really has something for everyone. One of Europe's most beautiful cities, Edinburgh is draped across a series of rocky hills overlooking the sea. Entwined with its landscape, buildings and monuments are perched on crags and overshadowed by cliffs. Crowne Plaza® Edinburgh - Royal Terrace hotel sits on a quiet residential street in Edinburgh city centre, surrounded by sprawling gardens and national monuments. Only a 25-minute taxi ride from Edinburgh Airport, the hotel is just around the corner from Edinburgh Waverley Station and Edinburgh Bus Station, as well as the financial district around George Street. Visiting the city? 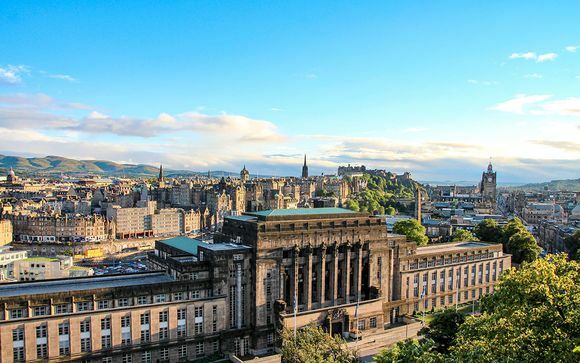 The hotel is within walking distance of Edinburgh Castle and the Royal Mile, as well as the National Museum of Scotland, the Palace of Holyroodhouse, and Edinburgh's top shopping streets. Start you day with an extensive breakfast buffet or a visit to the fitness centre, which includes an indoor pool, a perfect place for a morning workout. Once work or play is over, unwind with dinner at the stylish Terrace Restaurant, which opens onto a private terraced garden, and enjoy cocktails in the Lounge Bar. This offer is based on a Standard Twin or Double Room. The cosy en-suite bedrooms have all the amenities you need for a brilliant stay. 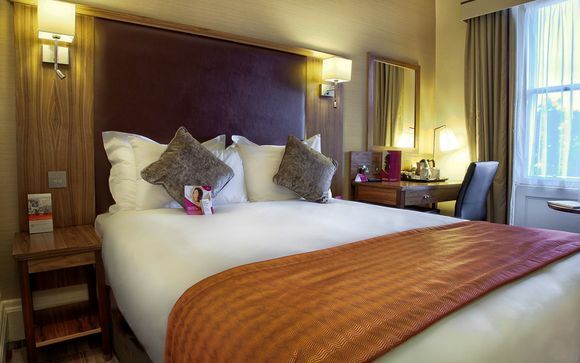 Specialist beds offer enhanced levels of comfort, whilst free wi-fi helps you stay connected. Enjoy the use of tea/coffee making facilities, flat screen TV, air-conditioning and toiletries - the ideal home away from home! This offer is based on a bed and breakfast stay. Just for you: 3 course meal. Enjoy a variety of food and drink options throughout the day, from fine dining to lighter meals at the full-service, on-site restaurant and lounge. The Terrace Restaurant is located on the ground floor and opens out onto the hotels beautiful terraced private garden. You may have pre-dinner drinks in the garden or inside at the bar. The restaurant offers both Table d Hote and A la Carte menus and sources local Scottish produce where possible. The Lounge Bar is open daily serving a selection of hot and cold drinks, light meals and afternoon tea. There is a varied and wide selection of Malt Whiskies for you to enjoy. Please be aware that due to kitchen maintenance, there will be a limited food offering from the 9th to 13th January 2017. The hotel will be providing a reduced menu for breakfast, lunch and dinner. Maintaining your routine while traveling is important, especially when you're short on time and on the go. The right workout—right when you want it—helps you stay focused, energised and on top of your game. So, recharge and feel ready for anything with the fully equipped fitness centre and wellness options. 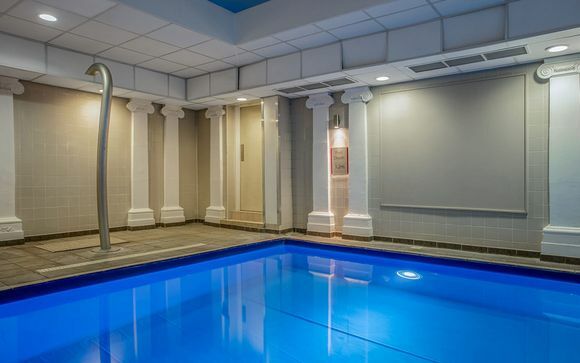 Guests can also benefit from use of the indoor pool and steam room! Approximate time/distance to hotel from airport is 30 minutes/9 miles.